Eyebright, Euphrasia rostkoviana, is also known as Large Flowered Eyebright and Sticky Eyebright. This is a cousin to the commonly mentioned species E. officinalis and is medicinally interchangeable.This is a dainty little plant that produces oversized flowers and provides better yield than the official species. Generally a sybiot of grasses, this species seems to be self suffient. 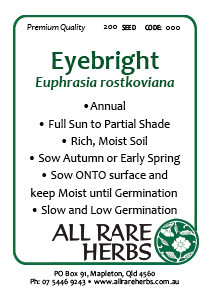 Germination of Eyebright seed can be as low as 10% and may take up to 10 weeks. When plants have grown to about 12cm flower production commences on the multiple branches. Flowers are lilac with a yellow spot. Be the first to review “Eyebright, seed” Click here to cancel reply.